​​​By default, tasks are scheduled based on the project calendar. To define unique or specific exceptions (exception: An instance in which a task or resource calendar differs from the project calendar. An example is a resource that must work on Saturdays, but for which the project calendar does not include working time to cover these instances) such as machinery that runs during nonworking time, you can create a task calendar for individual tasks. On the Project menu, click Change Working Time. In the Name box, type a name for your new calendar. To begin with a default calendar, click Create new base calendar. 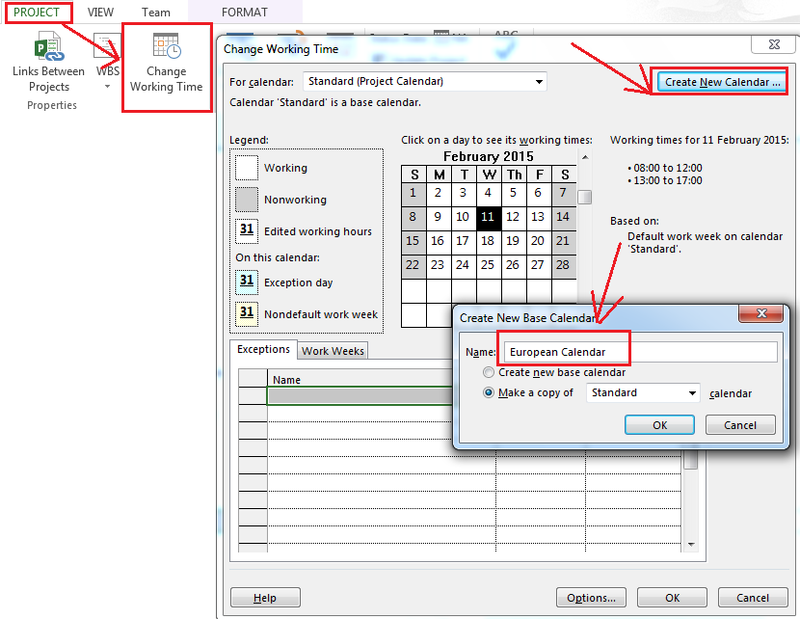 To create a new base calendar based on an existing calendar, click Make a copy of, and then click the calendar name in the calendar box. To select adjacent days on the calendar, hold down SHIFT, and then click the first and last days you want. To select nonadjacent days on the calendar, click the the days you want. To change a day of the week for the entire calendar, click the abbreviation for the day in the top row of the calendar. Under Set selected date(s) to, click Use default, Nonworking time, or Nondefault working time. 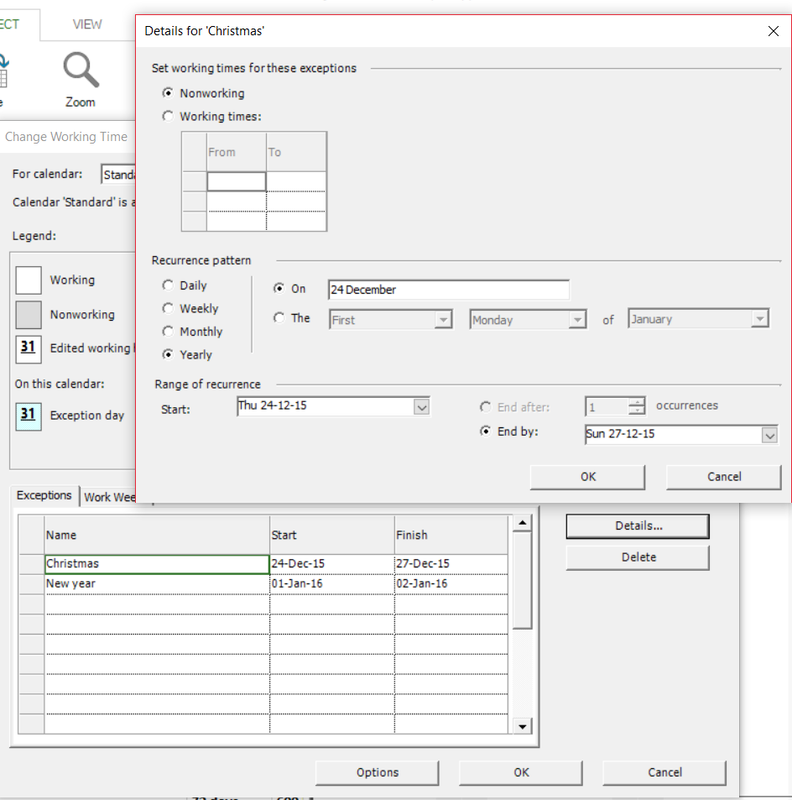 To change Nondefault working time, type the times you want work to start in the From boxes and the times you want work to end in the To boxes. Note After you create a base calendar, you need to assign that calendar to a task. 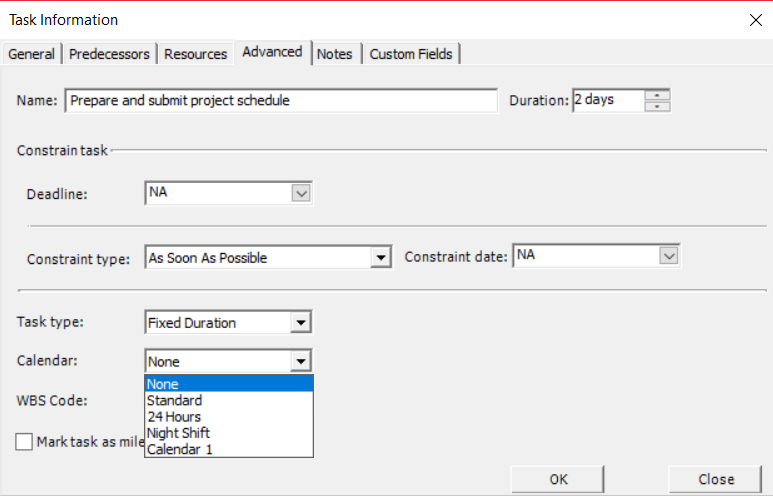 When defining a calendar, exceptions such as holidays, vacations or medical leave, can and must be added for an accurate estimation of your projects’ duration. Exceptions can be added in the Exceptions section from Change Working Time dialog box available from Project menu. On the Exceptions tab, add a name, start date, and finish date for each holiday or vacation day. 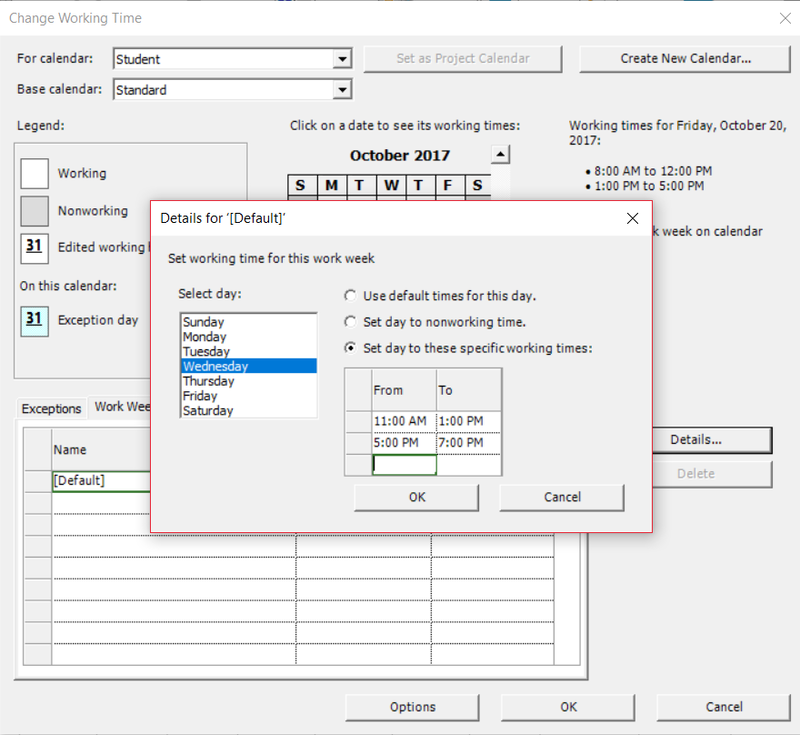 Certain days of the week can have a special program and it can be established in the Work Weeks section from Change Working Time dialog box. For example, considering that Friday is a though day and it is hard to concentrate for 8 hours, we can set its’ working hours to a smaller value, like 6, by setting day specific working times, as below. Any exception that recurs after one of the given patterns, can be set just once and then transformed into recurring exception by choosing the proper recurring options from the Recurrence pattern and Range of recurrence sections. Some of the available recurring patterns are: Daily, Weekly, Monthly on a certain date, or the first Friday of every month. Other recurrences can be obtained by combining the given options from the Recurrence pattern section. Also, there can be recurring exceptions that take place during a certain phase of the project. This special pattern can be obtained by setting the Range of recurrence from the Details dialog box. Recurrences do not refer only to nonworking times. There might be as well exceptions in terms of working hours. For example: an unexpected problem appeared and the team has worked an entire day to solve it. In order to avoid a postponing, they decided to work 1.5 hours over the program for a week. In the Change Working Time dialog box, in the Exceptions section, ‘Week Over’ exception is introduced and its’ interval is set. 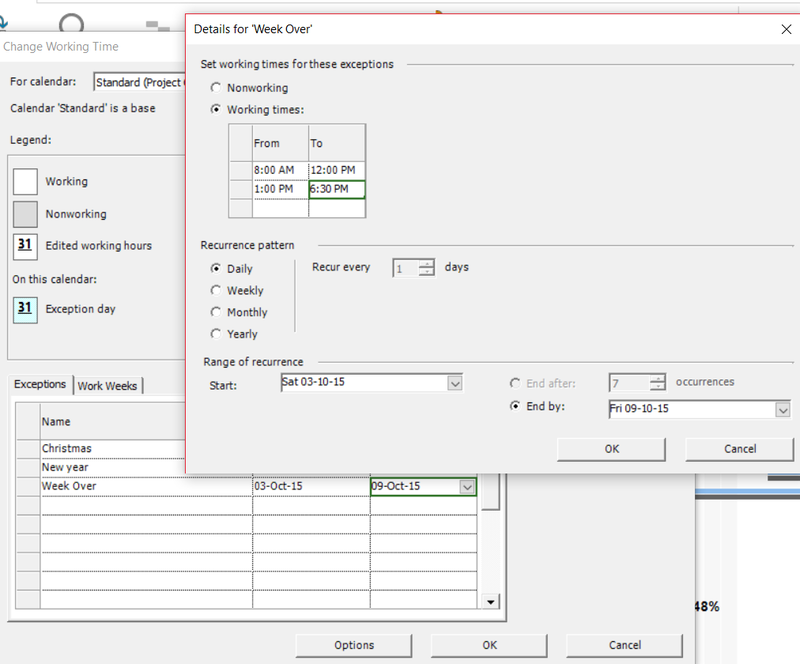 In the Details for ‘Week Over’ dialog box, which is displayed by clicking on the Details.. button, Working times intervals (from Set working times for these exceptions section) have to be introduced; Recurrence pattern is Daily in this case and the Range of recurrence is the week which employees choose to work 1.5 hours more. After these settings have been made, click on OK button and the changes will be applied to the project. 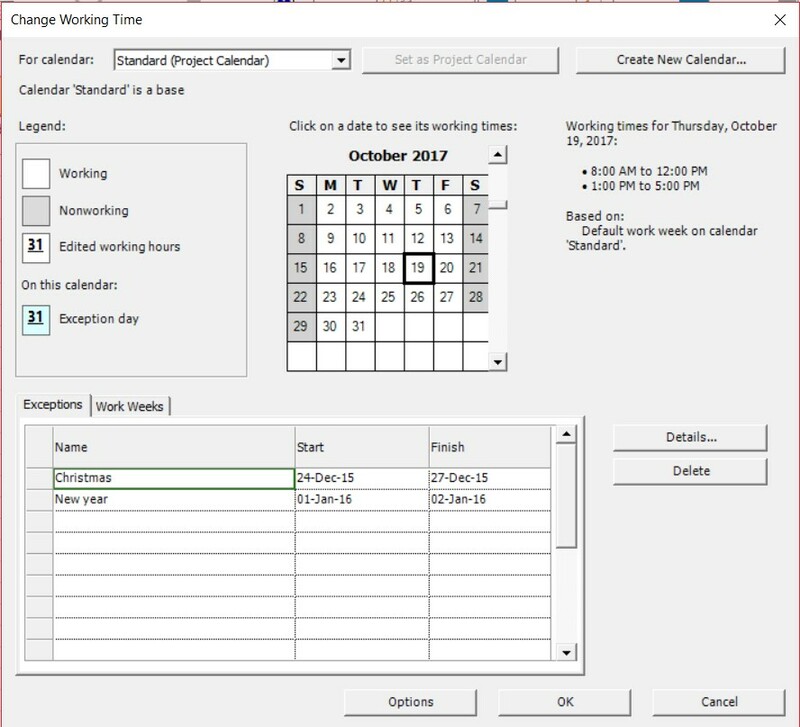 A base calendar defines the standard working and nonworking time for the project, specifying work hours and exceptions, such as holidays. Base calendars are used as templates for the project calendar, task calendar and resource calendar. The Standard calendar - is the default calendar for the project, and is the basis for resource calendars. This calendar reflects a traditional work schedule: Monday through Friday, 8:00 A.M. to 5:00 P.M., with an hour off for break. 24-Hours calendar - All time, from Sunday through Saturday, 12:00 A.M. to 12:00 A.M., is set as working time. The 24-Hours calendar reflects a schedule with no nonworking time at all. The 24-Hours calendar can be used when resources and tasks are scheduled for different shifts around the clock, or when equipment resources work on tasks continuously. Night Shift calendar - reflects a graveyard shift schedule of Monday night through Saturday morning, 11:00 P.M. to 8:00 A.M., with 3:00 A.M. to 4:00 A.M. designated as nonworking time for break. If none of the above base calendars, doesn’t meets your criteria, you can create your own base calendar, based on your current needs. This can be useful especially when you have different schedules for multiple resources. The project calendar defines the working and nonworking times for the project as a whole. It is used to schedule tasks that don’t have task calendars or resources assigned. 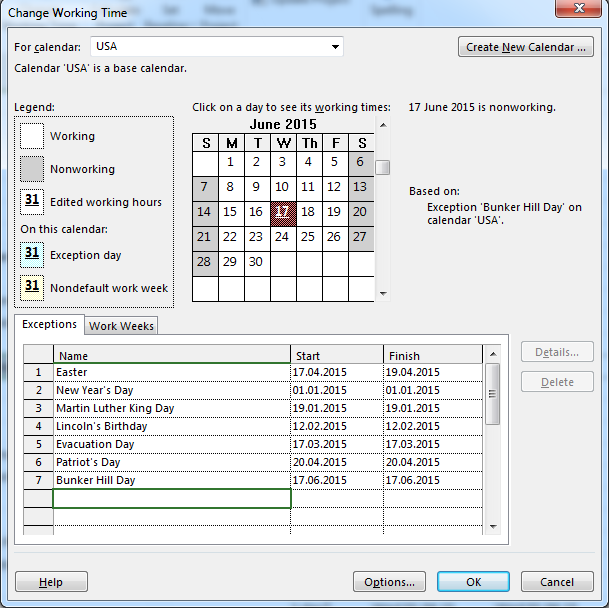 Special days off, holidays and other nonworking time can be specified from the Change Working Time dialog box. 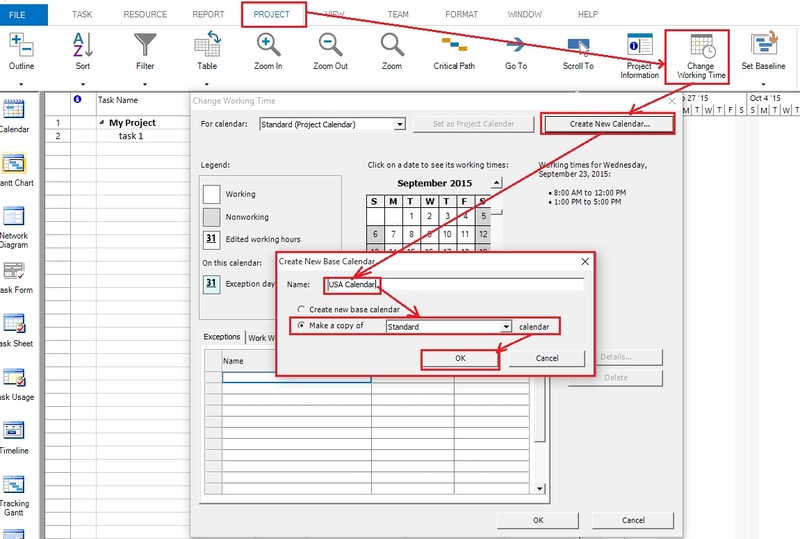 The project calendar can be set by clicking Calendar in the Project Information dialog box, and choosing a calendar from the list. Tasks calendars are very useful when you have to override the project calendar, so that a certain task will take place during nonworking time. Let’s say that each month a system update is performed. You do not want to waste a working day for this action, so it will be planned overnight (during nonworking time). In this case, a new calendar that satisfies these needs will be defined and assigned to the updating task. 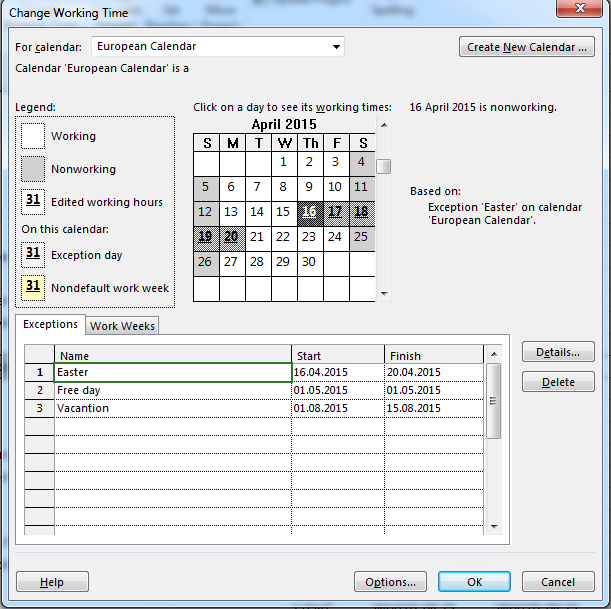 A task calendar is a new base calendar created from the Change Working Time dialog box. A task calendar can be applied to a task by using the Advanced tab in the Task Information dialog box. If the task has already assigned resources, it will be scheduled during the common working hours for the task calendar and resource calendar. A resource calendar is created for each resource you enter. 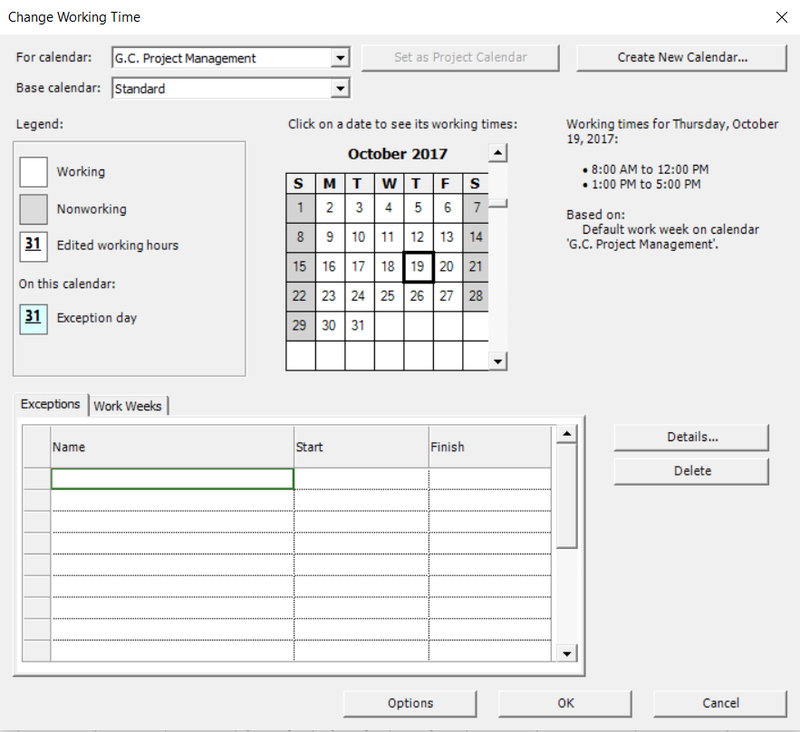 It is based on the project calendar working time settings, but can be customized. 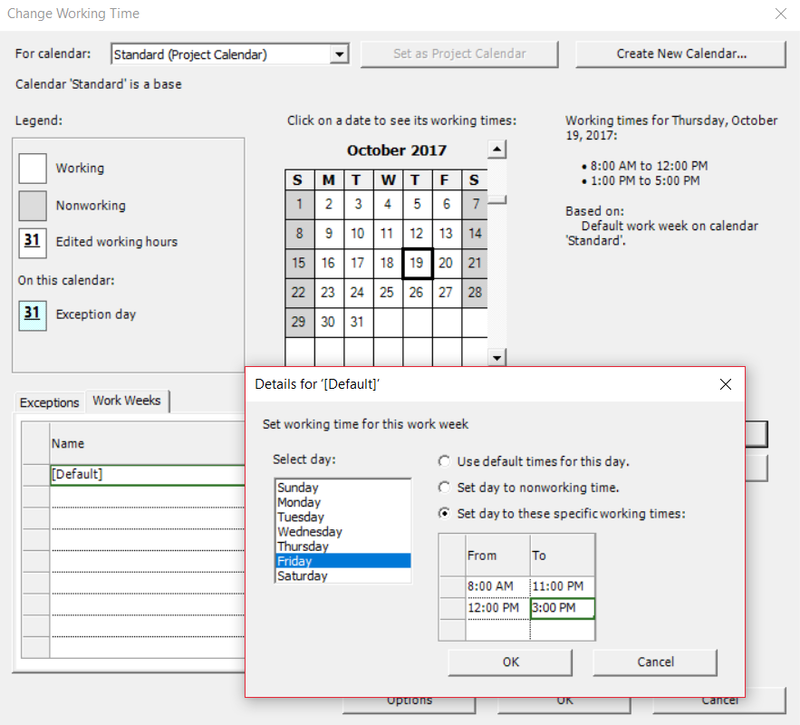 By opening Change Working Time dialog box from Project menu, in the For calendar: box, you can select which calendar to modify and add specific exceptions and nonworking time. Let’s say we have a student working to an important project. This project cannot suffer any delays, must be ready on the settled date. That is why its’ deadline has been settled, only after all of its’ resources had established their calendar. Also if you assign a resource to a task and then modify resources’ calendar (change its’ working times), the task is rescheduled to reflect the changes to their working times.